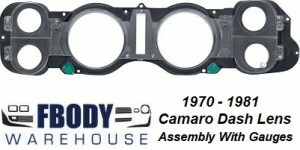 This is a new reproduction dash lens assembly for 70-78 Camaro. For use on Camaro's with gauges, this reproduction dash assembly includes the gauge lens and black plastic mount. Great way to bring life back to your gauge cluster! Also 1979 1980 1981 but youwill need Turn Signal Extension Prisms from your GM unit.